New geophysical investigations into a stone circle discovered in 2007 in Dartmoor, southern England, show the stones were once standing and may have been arranged in a “sacred” circle with seven other henges in the region. Most stone circles have been known all along or were discovered many years ago and were investigated in the Victorian era. Scientists are happy to have a new, unstudied circle to study, the first found in 100 years. The circle was discovered when workers did a controlled burn of undergrowth in a field to clear it. The stones fell about 4,000 years ago, scientists determined by doing radiocarbon dating of the soil underneath. Researchers are certain the stones were standing because they discovered packing material near their bases. Some other lunar stone circles in Scotland were designed with recument stones. There are about 1,000 stone circles in the British Isles, says the site Ancient Wisdom . They are also found in other parts of the world, some dating back a considerable time before the circles were built in Britain. One in Turkey dates back to 9000 BC. 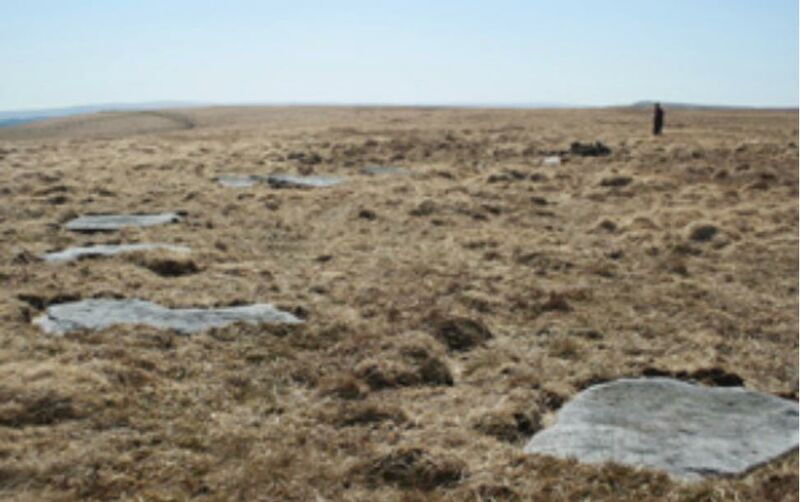 The discovery fits a pattern of a ‘sacred’ arc of similar stone circles, located in the north-eastern part of Dartmoor. Eight separate circles form the crescent, from Whit Moor running south to Grey Wethers. The layout of the arc suggests there was planning and liaison between the communities living on Dartmoor in the late Neolithic/early Bronze Age 5,000-4,000 years ago, researchers say. Thirty of the stones in the Sittaford circle are lying flat. One is in a gap outside the circle and is incorporated into an unfinished enclosure wall. Geophysical surveys have so far also revealed a wide ditch running in a line outside the circle. Archaeologists think the stones probably came from Sittaford Tor, about a mile west of Fernworthy Reservoir. The circle is the second-largest on Dartmoor and is the highest in southern England. It measures 34 m (111 feet) in diameter and is 525 m (1,722 feet) above sea level. It is near Sittaford Tor on the northern section of the moor. Researchers say it would have dominated the landscape and would have been an impressive sight to behold. Only one of the circle’s 31 stones is upright, and it is incorporated into an unfinished enclosure wall. Researchers will study the site for five years with ₤1.9 million ($3 million) from the National Lottery through Moor Than Meets the Eye, a partnership of 12 bodies. Stone-circle development occurred around the ancient world for thousands of years, and there are several different types of circle, with several showing changes in use and design over time. Many stone circles have been shown to have strong associations with both geometry and astronomy, and in several examples, the specific location of the circle can be shown to have been more important than the availability of stone. The evolution of the stone circle reveals much about their probable purposes. It has long been suspected that henges were designed in order to create an artificial horizon line, and in Scotland, recumbent circles have been shown to have had an intimate lunar association. It is now reasonably accepted that most circles included astronomical orientations and alignments, and geometry, with the obvious inclusion of rituals of death (i.e. at Xaghra circle , Malta and Stonehenge, England). The site says not all stones in all circles are placed for astronomical purposes. The stones of most circles are spaced with an even distance between them, indicating symbolic rather than functional placement. It’s amazing that sites like this are still being discovered on this very populated island! If you take into consideration just how many ancient sites must have been destroyed and cleared over the years, there must have originally been many many more, coating the landscape.